Preheat waffle iron. Open can of biscuits and separate. Liberally spray waffle and place biscuits on waffle maker, close and cook for 2-3 minutes or until golden and crispy. Repeat this process until you have cooked all biscuits. Place waffles on baking sheet, using a spoon spread pizza sauce over waffle, top with pepperoni and cheese and bake until cheese melts. Serve warm with additional pizza sauce for dipping. Top with sliced olives, refried beans and salsa for a Tex-Mex version. Revamp a breakfast favorite into a fun meal. Fluffy biscuits are transformed into crispy waffles, but it doesn't stop there. 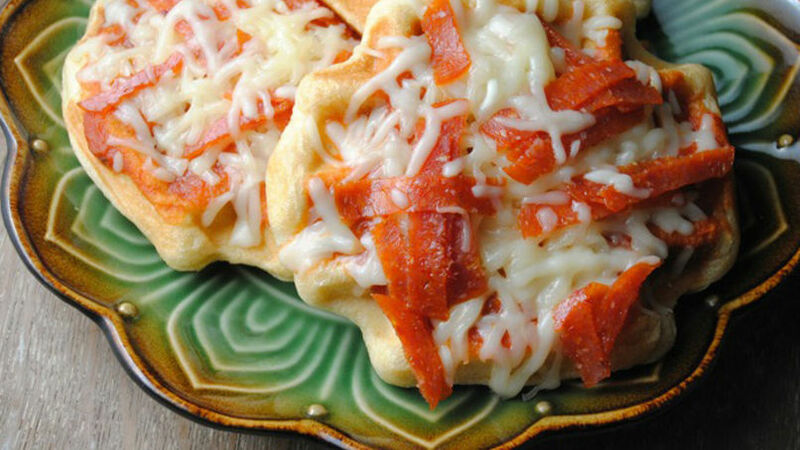 Top these tasty waffles with pizza sauce, pepperoni and loads of cheese for weeknight pizza that your kids will love.